The world of showjumping has lost one of its great competitors, visionaries and mentors today when Tim Stockdale passed away following a short battle with stomach cancer. 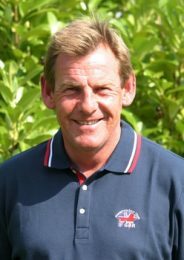 Tim was the highest placed British showjumper at the 2008 Beijing Olympic Games in Hong Kong, represented his country on more than 50 Nations' Cup teams, and enjoyed immense success during a career that spanned over three decades. Away from the competition arena, he served on various Boards and Committees, always striving to develop new initiatives and becoming a great innovator in terms of raising the profile of showjumping, especially at a national level. He was also an accomplished presenter and highly popular 'face' for the sport, with a unique delivery style and direct way of speaking. Iain Graham, Chief Executive for British Showjumping said: "Tim's passing will leave a huge hole in the sport. His support across so many different areas was both innovative and informed....". The Breeding News team extends their sincerest condolences to Tim's wife, Laura, and two sons, Joseph and Mark, and their close family and friends during this very sad time.